THE INSIDE SKINNY ON… lef Farms! Welcome to the land of lettuce, the paradise of produce, the emerald city of glistening greens! 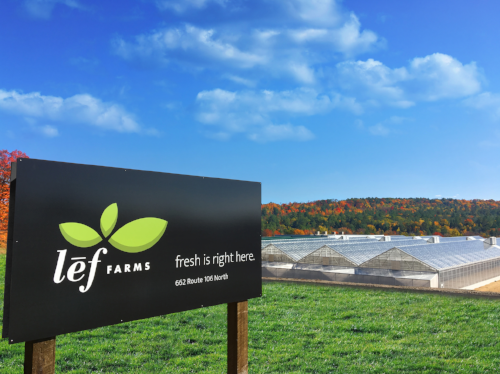 This week, we learn about a New Hampshire business that’s changing the way New England sources its baby greens… lef farms! Let’s meet this thriving business, shall we?? CAN YOU BRIEFLY TELL US ABOUT LEF FARMS? 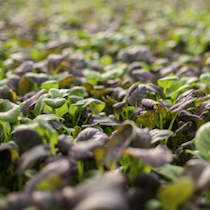 Our goal at lef farms is to provide New Englanders with incredibly fresh, tasty greens that arrive on plates within 24 hours of harvest. We want to do our part to give New England a fresh alternative – a better way to eat fresh, flavorful greens and make our region more food independent. Before we started lef in 2016, 95% of all greens sold came from California. WHERE IS LEF FARMS LOCATED? 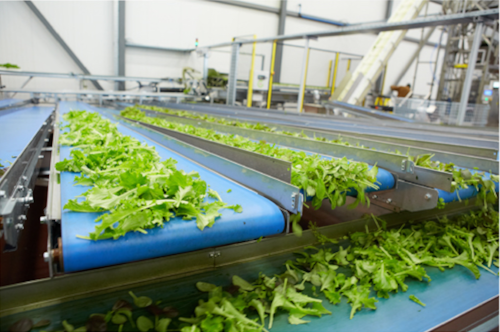 Our state-of-the-art hydroponic growing facility is located in Loudon, New Hampshire where we grow millions of pounds of fresh, baby greens a year. 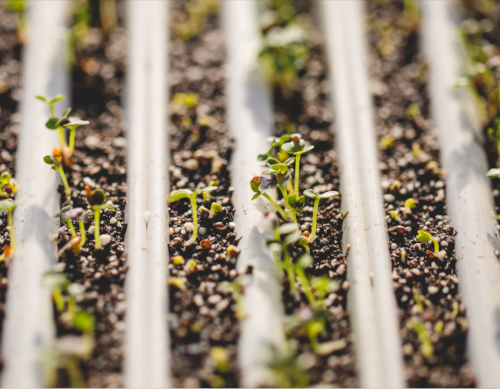 Our facility is designed to efficiently produce large quantities of greens in a small space, and guarantees our greens to be as tasty in January as they are in July! Our farm is nestled in a valley on reclaimed land where much of it was designated as wildlife refuge. It’s surrounded by woods and streams and, in our minds, it’s beautiful! YOU HAVE THREE PRODUCTS ON THE MARKET. WHAT ARE THEY? We have three unique blends on the market and some tasty recipes to share! SMOOTH is a blend of leaf lettuce, pac choi, mizuna and oaklef that’s buttery, crisp, and sweet. This mix of tender greens provides an ultra-smooth easygoing mix for salad connoisseurs who prefer to let the toppings or dressing bring the zest! 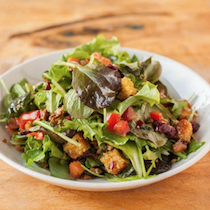 Try our Panzanella Salad! Our second mix is called SPICE, which is a blend of arugula, mustard, cressida, mizuna, and leaf lettuce. This flavorful combination boasts zesty flavor, crunchy texture, and adds a unique complexity to any dish! 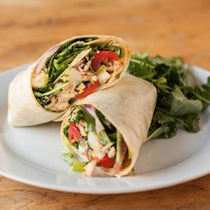 Our favorite recipe using this blend is the Tuna Nicoise Wrap. We call our third blend BALANCE – a beautiful combination of red and green baby kale. The name represents the balance in minerals, nutrients, vitamins, antioxidants, and iron packed into this party. A great recipe to enjoy this mix is Creamed Baby Kale! 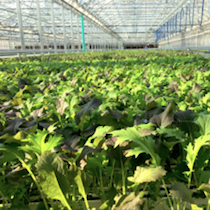 LEF FARMS PRIDES ITSELF ON OFFERING THE FRESHEST GREENS GROWN IN NEW ENGLAND, FOR NEW ENGLANDERS. WHY IS EATING LOCAL PRODUCE IMPORTANT? By producing our greens locally, we reduce food miles, grow food within minutes of our consumers’ homes, and avoid the typical 3,000-mile trek from the west coast. Eating local gives consumers a chance to get to know the farmers who produce their food. Having a direct source where consumers can directly talk to farmers at grocery store demos, events, and local foodie is a great way to bolster consumer confidence, as well. YOU RECENTLY INTRODUCED CLAMSHELL PACKAGING. HOW DOES THAT IMPROVE THE PRODUCT AND CUSTOMER EXPERIENCE? After listening to our consumers and constantly wanting to further perfect our products, we made the switch to offer our lettuce blends in clear boxes (also known as a “clamshells”), rather than black bags. As a result, our packaging is now easier to stack in stores and in refrigerators at home. Plus, the re-sealable closure helps reduce wilting lettuce and keeps greens as fresh as can be! Our new clamshells offer nearly 95% product visibility, so consumers can see more of our beautifully fresh greens right at the store. As we transitioned to clamshell packaging, we took into consideration environmental implications. Although our bags were recyclable, our new clamshells are made of a much more commonly recycled material – making them more easily recovered by most community programs. WHAT MAKES YOUR GREENS DIFFERENT THAN OTHERS OUT THERE? 1. Our greens are grown without the use of any pesticides. Since our greens are clean from day one, there’s no need to wash or treat them with flavor-altering chlorine baths. 2. We run a completely hands-free operation. Most food-borne illnesses come from hand-to-food contact. The main culprit? Harvesters with dirty hands. Our fully automated system eliminates human contact from our production process. From seeding and growing, to harvesting and packaging, we don’t put a single finger to our greens. The first hands that ever touch your delicious lēf greens are yours. You might be thinking to yourself right about now, “where can I enjoy some lef greens of my own“?? See locations here, and if your local grocery store doesn’t carry lef, talk to the produce manager! Thank you for sharing your story with us lef Farms! We can’t wait to continue fueling up on your tasty greens!